Save Popponesset Bay – The American Shore and Beach Preservation Association (ASBPA) announced today that the Popponesset Spit, Mashpee, MA is a winner of its 2017 Best Restored Beach Award. 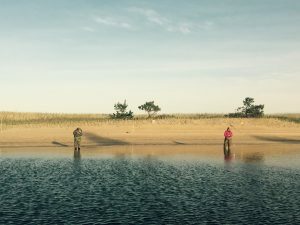 The Popponesset Spit (“The Spit”) is a fragile, natural barrier peninsula and wildlife sanctuary that protects Popponesset Bay from Nantucket Sound, Mashpee’s watershed and other land throughout Mashpee and Cotuit. The Popponesset Spit is owned and protected by the local non-profit organization, Save Popponesset Bay (SPB), and Mass Audubon Society. The $1.4 million restoration project was made possible with the financial support from individual donors, a competitive state grant (CZM), and close collaboration with the Town of Mashpee. In addition to providing habitat to endangered shorebirds, the area relies on the Spit to provide vital shelter to the flourishing ecology of Popponesset Bay, afford critical storm damage protection and flood control to hundreds of properties around the Bay, and protect numerous navigation channels within the Bay. 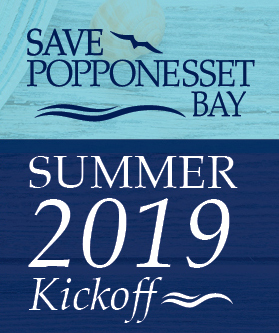 “Save Popponesset Bay is thrilled to receive this award, but more importantly we appreciate the opportunity to highlight the value of collaboration to preserve and protect our vulnerable coast and wildlife sanctuary,” says Michael Oleksak, President of Save Popponesset Bay. For almost 60 years, beach restoration has been the preferred method of shore protection in coastal communities on the east, west, Gulf and Great Lakes coasts. Beach restoration is the process of placing beach-quality sand on dwindling beaches to reverse or offset the effects of erosion. Storm protection– A wide sandy beach helps separate storm waves from upland structures and infrastructure. Habitat restoration– Numerous species rely on wide, healthy beaches as a place to live, feed and nest. Recreation– America’s beaches have twice as many visitors annually as all of America’s federal and state parks combined. Every year, there are more than 2 billion visitors to America’s beaches. 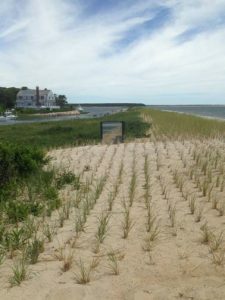 To enter the Best Restored Beach competition, coastal communities nominated their projects for consideration, and an independent panel of coastal managers and scientists selected the winners. Judging was based on three criteria: the economic and ecological benefits the beach brings to its community; the short- and long-term success of the restoration project; and the challenges each community overcame during the course of the project. Popponesset Bay is critically dependent on Popponesset Spit, known locally as “the Spit,” to maintain a healthy bay ecosystem, a navigable channel and improved water quality, and to act as a shield from the force of storms and ocean waves. The Spit is home to many endangered shorebird species such as piping plover and least terns. For years the Spit has struggled to remain a barrier beach, and the increased intensity of storms threatened this vulnerable coastal area. Historically, the Spit had been subject to an average erosion rate of approximately -5.0 ft/yr, which led to significant narrowing of the beach, numerous dune breaches, and storms overtopping the barrier regularly. Seasonal channel dredging had been the primary source of beach nourishment, and had not yielded a sufficient volume of sand to keep up with the effects of coastal erosion and sea level rise. 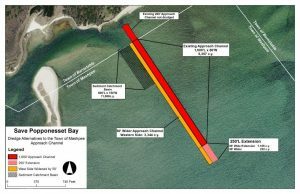 Consequently, the Spit had become more vulnerable than ever before and was slowly disappearing; coastal engineering consultants, Woods Hole Group, deemed the Spit “in critical condition.” The community understood a longer term solution was necessary or the loss of the Spit would be imminent. Neighborhood volunteers at Save Popponesset Bay launched in 2014 the first campaign to fund a substantial nourishment project. As a result of strong community financial support, more than 60,000 cubic yards of sand, which was dredged from the channels or trucked in, was placed on the dunes and beach to restore the height and dune elevation on about 2/3 of the spit. The ongoing project has significantly improved the resiliency of the Spit and the Bay and is helping to restore the natural habitat for endangered water birds, mitigate erosion, improve storm damage prevention and flood control for the Bay and surrounding area, and enhance navigational safety and reliability. Entering its third, year, SPB hopes to raise another $2 million to fully implement its restoration plan. The project continues to strengthen the partnership of all community stakeholders by working on common goal: Save the Spit and the Bay, which will benefit not only the environment and local community, but also its feathered residents, for years to come. A press event and tour will be held by Save Popponesset Bay at the Popponesset Spit on July 6, 2017. 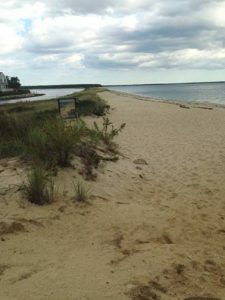 A complete list of award-winning beaches, and more information about beach restoration and ASBPA, is available online at www.asbpa.org. ABOUT ASBPA: Founded in 1926, the ASBPA is a 501(c)3 nonprofit that advocates for healthy coastlines by promoting the integration of science, policies and actions that maintain, protect and enhance the coasts of America. For more information on ASBPA, go to www.asbpa.org, Facebook or www.twitter.com/asbpa. This information is provided by the American Shore & Beach Preservation Association. About Save Popponsesset Bay (SPB): SPB is a 501(c)3 non-profit organization founded and run by neighborhood volunteers to ensure the sustainability of the Bay and the Spit for generations to come. Entirely funded through charitable donations, SPB has actively protected the Bay and Spit since 1987. SPB owns two-thirds of the Spit (Mass Audubon owns the eastern tip), and is home to several species of endangered terns and plovers that they collaborate to protect. SPB owns and manages the permitting needed to dredge the channels and redeposits the sand on the Spit. Through its relationships with Mass Audubon, the Town of Mashpee, and federal and state agencies, it supports a shared vision of environmental sustainability and seeks public-private partnerships to fund its mission. Thank you to SPB supporters!